The smoothly styled New York collection features sharp and minimalist elegance. 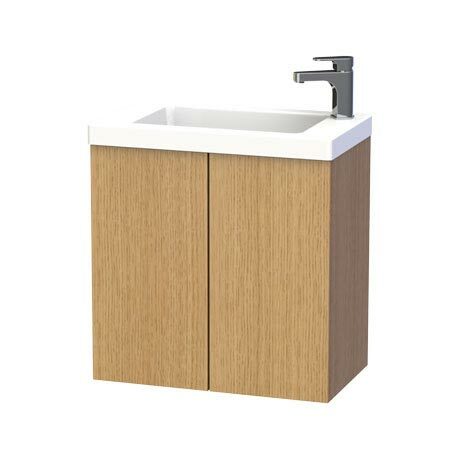 This natural oak finish 60 Wall Hung Two Door Vanity Unit with Ceramic Basin features soft closing doors with an an internal adjustable wooden shelf. This unit also comprises of a single tap hole rectangular ceramic basin and a pair of stylish chrome handles. Fitted with mounting rails and brackets for adjustable and quick installation. Largely made of veneered panel materials. Backs, shelves, etc. are made of veneered or foiled panel materials. Please note: tap and waste sold separately. Additional images for illustrative purposes.